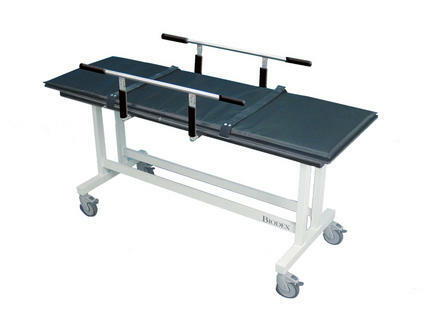 This heavy-duty, all aluminum non-magnetic stretcher is ideal for MRI patient transport. Finished in attractive white powder coat, it comes complete with mattress, restraining straps and retractable guard rails. Although light in weight for easy, controlled mobility, the MRI Stretcher accommodates up to a 500-lb patient safely and comfortably. It rolls on 5" ball-bearing swivel casters that lock firmly to secure the stretcher in place when positioned. Optional IV Rod mounts in a socket at the head end of the table.